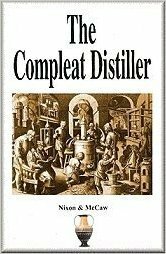 If your trying to make a coil condenser for your moonshine still this article will help you do that. If you’ve already tried to make one and failed this article will show you the right way. There are a few tricks to making a homemade copper coil condenser and are several different ways you can wind your coil. I’ve shown you the one I like best and have listed other ways below this tutorial and linked to other sites offering good information on the other methods so don’t forget to check them out. Step 1 – Unwind the length of 1/4 copper tubing you’ll be using for the condenser coil. Seal up the one end with tape. Step 3 – Fill the funnel with salt and turn the sander on (make sure you remove the sandpaper from the sander first) use it to vibrate the 1/4 tubing. The salt should flow nicely into the tubing now. Keep filling the funnel until the tubing is completely filled with salt. Step 4 – Remove the funnel and tape this end to seal the salt into the tubing. Note: You may be wondering why were filling the tube with salt? The salt will keep the tubing from collapsing when we are bending it. Thus preventing kinks in our condenser coil. It is also easy to dissolve later when we want to remove it from the inside. You can also use wax bout I find salt the easiest. Step 5 – Take the end of the 1/4″ tubing and bend 12 ” of it at a 90 degree angle. Then zip tie this end tightly to your 3/4 ” pipe. Step 6 – Start bending the copper around the pipe starting at the bottom of the coil making sure to keep it as snug as possible to the pipe. Try to maintain roughly a 1/8″ gab between coils. Step 7 – Once you’ve reached the required length of coil you wish to make remove the zip ties. Bend the left over bit 90 degrees so it’s end is in the same direction as the inlet. Your condenser coil should look something like the one above. Step 8 – Remove the salt by boiling in water for several minutes. once you boil it hook it up to your tap to rinse out any salt remaining inside. Because a video’s better than 1000 words here are two that will show you the basics of how to wind a copper condenser coil for your homemade still. I wanted to give a big shout out to Louwrens van der Merwe for making the video’s below. Best damn coil I’ve ever seen keep on shining boy! This one show’s you how to fill the 1/4″ copper with salt. 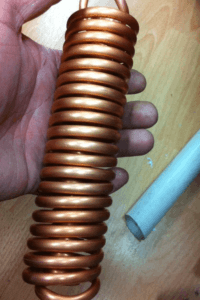 If your interested in making a double coil condenser which will give you greater cooling capacity check out this Winding a Copper Double Coil Condenser For Reflux Still.pdf I found online! Thanks to Hook for providing this! There is also a good tread over at http://homedistiller.org/forum/viewtopic.php?f=62&t=11554#p6800773 which explains how to make a coil without filling it with salt. I’d love to hear from you, leave a comment letting me know how you made your coil and share some photo’s with us. 4 Responses to "How To Make A Copper Coil Condenser At Home"
Instead of salt why not use depilatory wax? Attach a large syringe onto one end of the straightened piece of copper tubing with a rubber tube then place the opposite end in the melted depilatory wax then draw back on the syringe plunger filling the copper tube with hot wax, then after a few hours when the wax gets hard, bend the copper tubing into the desired coil size, once the coil is done, set it in a pan in a upright position and place it in the oven at about 300 Degrees F. to let the wax melt and drain out of the coil into the pan. That’s a great idea next time I make a coil condenser I’m gonna try it this way. Anyone try the salt method or Thomas method with the wax ? What way did you find works better..
How much will you charge to make one of these? I need a 8 inch coil to fit a 3 inch tube. I have the cap and means of connecting mechanisms. Thanks. Anyone want to make Phil a copper coil condenser ?